This is a really quick and easy project that you and the kids can both enjoy. 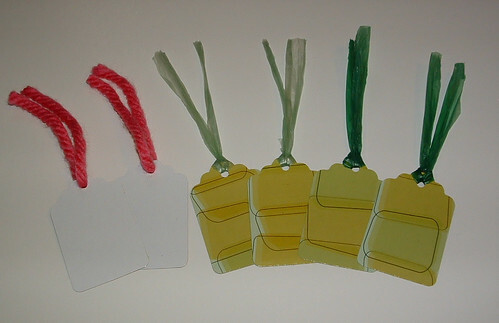 Let the kids cut strips of yarn or other recycled materials for the ties and voilÃ — you have yourself some cute and free gift tags. How clever! Good thing I just went around the house the other day and collected four empty kleenex boxes and put them in the recycling bin! You are so inventive! Thanks for the idea! That is a neat idea. Did you use a punch? What size are the tags? Just think when the xmas boxes come out… Christmas tags. I used a Marvy Uchida punch that I bought at Michaels. 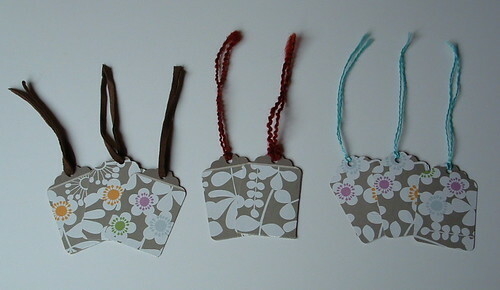 The tags are 1-7/8″ wide by 2-3/4″ long. I used a hole punch to put the top hole in the tag. Another great project, I love this one. 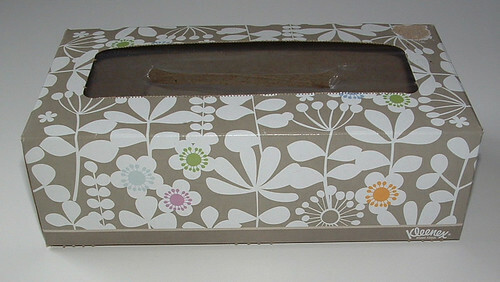 This is perfect for Christmas, I use to make gift tags and I never thought about this Kleenex box.